Mono printing is an interesting activity more commonly associated with working on paper. The possibilities for working with clay are endless however. Here are some tips when working with gelli plates. Gelli plates are sensitive so do not use sharp instrument when designing on them. Store the gelli plate clean – it will clean up with water and soap and dabbed dry or it can be cleaned with baby wipes. 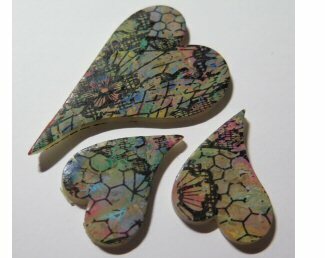 Put your gelli plate onto a tile or a piece of glass. Have clay, to the size of your gelli plate, ready for use. Shadow prints are effective so have at least two pieces of clay available (shadow prints are produced when you put a second piece of clay onto the existing design on your gelli plate). Apply dots of paint, sparingly, onto the plate. Roll the paint all over your plate with your roller. Place your sheet of clay on top of the plate, place a piece of paper on top of the sheet of clay and rub firmly to impress the design onto the clay. Put your second sheet of clay onto the remaining ink design on your gelli plate, impressing it again with a piece of paper over the top of the clay. 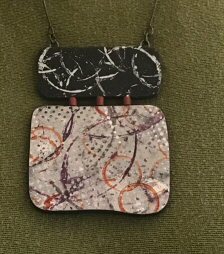 OR you can now choose to decorate each piece further using masks, threads, leaves and tools on the gelli plate before impressing your second sheet of clay. You can then decide which part of the resulting pattern is suitable to create and cure. Produce a base colour, or base design using the gelli plate. A pale shadow print without adding more paint. When completed clean your gelli plate with soap and water or a baby wipe. NB Use soufflé clay and once you have completed the design on your piece of clay used the scrunched up grease proof paper to make your piece look like leather. Add thinner (surgical spirit or alcohol works well as a thinner) and watch a design appear.